The Irish senior ladies team entered the Greenacres Invitation specifically to have some fun, and in the case of Marie, Christina and myself, enjoy playing together for the first time since 2013. Margarita Sweeney-Baird kindly made up the four and we had a team. The journey to the final was a charmed ride on occasions, but we also put in some solid performances, particularly in the semi-final. 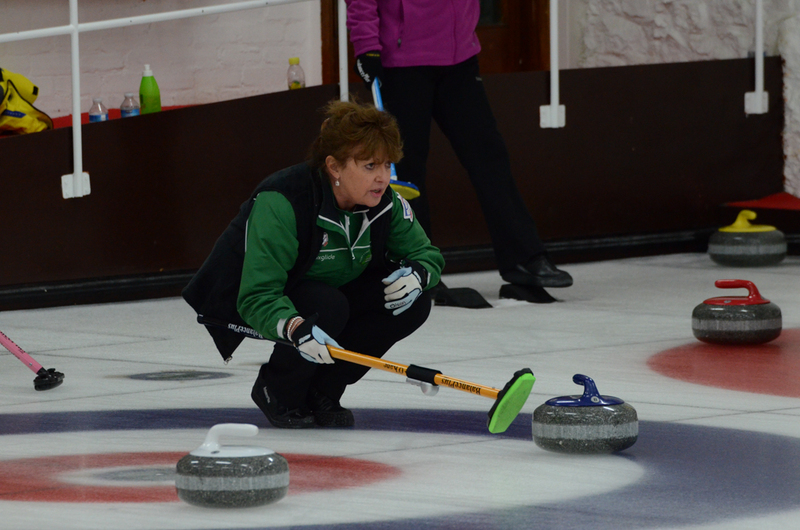 It was an ominous start, getting soundly beaten by Kay Gibb’s Scotland team 9-5. But in the evening game we got the better of Gunilla Edlund’s Swedes 7-4. That team had only three players as the fourth was suffering from a heart problem. That’s the seniors for you. Next day we played the lovely English ladies, skipped by Judith Dixon and won 9-3. It was an early start on Friday morning through the back against former winners, Susan Limena’s Swiss team. We really used up all our get out of jail cards in this one. Susan had a fairly straightforward tap back for a seven at one end but played heavy and we only lost a two. Three down going into the last end we looked good for a two to lose the game by just the one shot. The Swiss skip, who had hardly missed anything all game, had a simple take out for the win but inexplicably hoofed it down the rink like an Exocet. It just clipped the side of our stone, moving it five inches nearer the door and Marie calmly drew for a three. We were as shell-shocked as they were afterwards. That left us at the top of the group, a situation so rare Marie was taking a photo of the score-sheet to show to husband Gerry. We then met last year’s winners, Marie Henriksson’s team from Sweden, in the last group game, and we won again! 8-7 this time. Although Johnjo was, once more, drained of all colour after watching our antics in the last end. Nuff said. We won and were now in the semis. When Marie and I got back to Bridge of Weir that night, Gerry had the champers on ice and having packed my case and said my farewells that morning I had to unpack it all again. Saturday morning’s semi-final against Switzerland’s Karin Felder was memorable indeed. We got ahead of them by four shots, but one missed guard when we were lying two in the sixth saw them hit for one and then they stole a two in the seventh. My last stone in the eighth was an attempt to hit their shot out on the straight side of the sheet but it never drew and inch and just nicked their stone, rolling it into the four foot. The Swiss skip tried to guard it but again, on the straight hand, her attempt did not cover their shot. If we peeled the game, they went to the final as they had more ends than us. So, skip Marie’s last stone at the last end for a place in the final was a hit though a 18 inch port. Straight side of the sheet at strike weight. We never had any doubt that she would nail it and as it sailed though the hole to its target I heard a huge cheer go up from behind the glass! The boys were in the final and now so were we. Jackie, Christine, Issy and Janet gave us a pasting in the final after we struggled with draw weight. And whereas with some of the other teams, the odd miss was not always punished, against that class of curler it was. 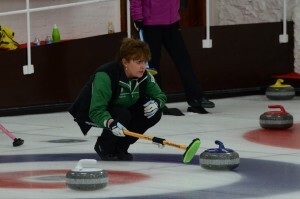 But what a thrill to be there playing the final and what a day for Irish curling. So, having packed up and said a second farewell to poor bemused Gerry, it was Groundhog Day as I rolled back up the drive in Bridge of Weir and unloaded my case again. More champagne for the Irish girlies, thanks to Gerry, before heading to the dinner. Poor Marie then had to raid her wardrobe to find me something to wear as the dressiest thing I had with me was my pyjamas.